NEMESIS will participate at exhibition “EUROCARNE” edition 2012 in Verona, from 24 to 27 May. It will be exposed, in addition to the complete weighing and labeling line HSC350 , the new 2012 series of machine. Eurocarne 2012: 25th International Exhibition for the Meat Industry. The event boasts a long tradition and has been increasing its success edition after edition, culminating in its 25th staging, the Silver Edition. 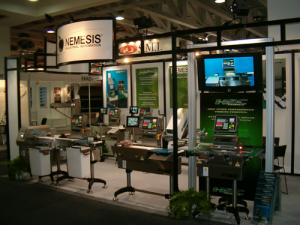 NEMESIS is proud to announce that checkweighers will now have completely renewed electronic boards. A new MID certificate with higher performances is under process and soon it will be available for sale. Furthermore, a custom I/O module will be available for custom solutions. Why buy a metal detector? Why buy a weigh-price labeler?